A Delta 4 rocket made a thunderous departure from California on Tuesday afternoon, only to slip into a news blackout minutes later while it climbed higher and faster to deploy a classified spy satellite, a success-defining milestone that was confirmed by hobbyist observers. The United Launch Alliance-made booster roared away from Vandenberg Air Force Base at 4:12:57 p.m. local (7:12:57 p.m. EDT; 2312:57 GMT) on a southwesterly course to reach a retrograde orbit inclined 123 degrees relative to the equator. A pair of strap-on solid boosters burned out 90 seconds later, then peeled away as the liquid hydrogen-fueled main engine continued to accelerate the 21-story rocket over the open Pacific. When the 47-foot-long nose cone was jettisoned three-and-a-half minutes into flight, the now-standard veil of secrecy fell over the mission to halt any further live updates about staging or burns by the upper stage engine to inject the satellite into space. The hush-hush nature for the rest of flight is all part of launching covert payloads for the U.S. National Reconnaissance Office, the secretive agency that operates the country's fleet of spy satellites. The NRO does not disclose the purpose of its spacecraft being sent up on each launch, saying only that the flight was called the NROL-25 mission. But a band of precise satellite-tracking specialists linked together by their hobby and the Internet was poised to look for the newest object in the sky, adding the spacecraft to their catalog. Given the rocket's unusual trajectory to the southwest, analysts were certain the satellite was the second in a new generation of radar-imaging surveillance craft used by the NRO. The first launch in the series took the same path from Vandenberg aboard an Atlas 5 rocket in September 2010. And right on cue, the new spacecraft flew overhead Tuesday night exactly where the observers expected it to be. "Today's successful launch is a tribute to the hard work and ingenuity of our government and contractor team and I am very proud of them. After the six successful launches last year, our 50th anniversary year, we proved tonight we can continue that hitting streak as we work to deliver superior vigilance from above for the nation," said Col. James D. Fisher, director of the NRO's Office of Space Launch. 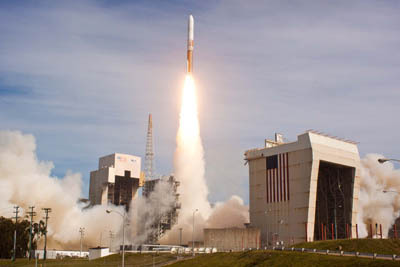 The NRO has three more launches slated for this year, including an Atlas 5 and Delta 4-Heavy from Cape Canaveral in late June and another Atlas 5 from the West Coast in early August. This was the maiden mission for the Delta 4 Medium+ (5,2) configured rocket, the last of the family's five members to take flight. It used previously-proven elements of the vehicle like the five-meter upper stage and twin boosters to assemble this particular version to carry the given size and weight of the payload. "Congratulations to the NRO and to all the mission partners involved in this critical national security launch," said ULA Missions Operations Vice President Jim Sponnick. "ULA is proud to have supported this mission and delivered critical capabilities to the men and women defending our freedom throughout the world." Radar satellites offer all-weather, day-and-night imaging for reconnoitering global hotspots to inform policy makers and warfighters. These newest, advanced spacecraft follow the heritage of five "Lacrosse" radar birds put up by the space shuttle Atlantis and Titan 4 rockets between 1988 and 2005. The updated satellite design is smaller and less massive, enabling the craft to fly aboard mid-sized Atlas 5 and Delta 4 rockets. The intelligence-gathering craft probably use a synthetic aperture radar system to observe strategic targets around the globe in both daylight and darkness. The eyes-in-the-sky can pierce clouds and even reveal underground structures like military bunkers. Lacrosse satellites orbit in normal, 420-mile-high perches, but this new generation fly retrograde, or against the Earth's rotation, about 685 miles up. The rationale for the different type of orbit isn't known. At the time of Tuesday's launch, the first satellite in the new generation was flying westward over the southern tip of South America. "The teamwork between the 30th Space Wing, the National Reconnaissance Office, United Launch Alliance and numerous other agencies was seamless," said Col. Nina Armagno, 30th Space Wing commander at Vandenberg. "It's this synergistic mindset and attention to detail that led to our amazing launch today." The liftoff begins a stretch of 8 flights by the Air Force's Evolved Expendable Launch Vehicles -- the Delta 4 and Atlas 5 -- from Vandenberg over the next two-and-a-half years, according to Lt. Col. Brady Hauboldt, commander of the 4th Space Launch Squadron that oversees the boosters' operations at the California installation. "We are about to kick off a very, very busy time in EELV operations at Vandenberg. Right after this launch, we'll roll into our next mission -- an Atlas 5," said Hauboldt. "There is not much of a break." That rocket is scheduled for delivery to Vandenberg from its manufacturing factory in Alabama this month, and crew exercises to prepare for the launch also begin soon. Liftoff carrying another NRO payload is slated for Aug. 2. A Delta 4-Heavy vehicle arrives at the base this fall for blastoff next August, perhaps sooner, to launch a large NRO satellite. It will be second such flight by the mammoth vehicle from California. "We love it! We love to be busy out here. It keeps us sharp...and puts a spotlight on Vandenberg's contribution to national security," said Hauboldt. Also on tap is NASA's first Atlas 5 launch from the West Coast, deploying the next Landsat spacecraft in January, and a commercial Atlas 5 in March with the GeoEye 2 Earth imager.